Tutorial proposals must include an abstract, an outline, a description of the target audience, a preferred duration (1.5 or 3 hours), and a short biography of the presenters. Proposals should be, roughly, two- to four-page long and should include enough information to provide a clear sense of the proposed scope and depth of coverage of the targeted topics. If a proposed tutorial has been presented elsewhere, the proposal should indicate the venue, number of attendees, and a pointer to the slides of the earlier presentation(s), and specify what, if anything, would be different at ICDE 2011. 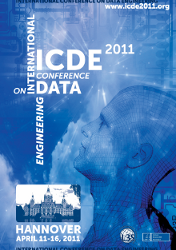 Tutorial proposals should be submitted via email to icde2011tutorials@listes.enst.fr by July 30, 2010. The notification date for the outcome of the selection process by the Tutorial Co-Chairs is October 30, 2010. The slides of accepted tutorials will be made available to the ICDE 2011 participants; the deadline for the final version of the slides of accepted tutorials is February 26, 2011.